Lacks MicroSD and headphone jack as attributes of poor scum. 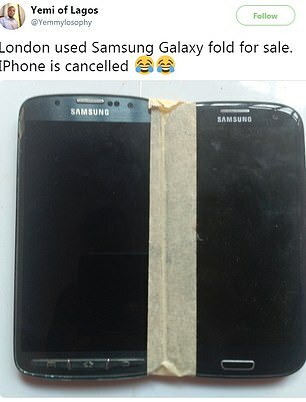 Most fun thing will be price you could sell this one year ahead :-). 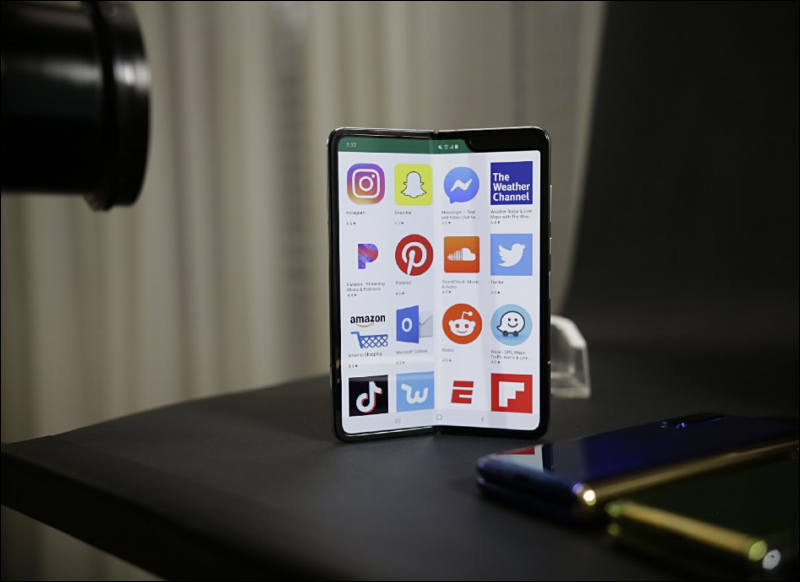 Samsung Electronics Co., Ltd. unveiled the highly anticipated Galaxy Fold, a new foldable device creating a new mobile category. Galaxy Fold features the world's first 7.3-inch Infinity Flex Display, which folds into a compact device with a cover display. Galaxy Fold offers a powerful new way to multitask, watch videos, play games, and more -- bringing to life new experiences and possibilities years in the making. "Today, Samsung is writing the next chapter in mobile innovation history by changing what's possible in a smartphone. Galaxy Fold introduces a completely new category that unlocks new capabilities never seen before with our Infinity Flex Display." said DJ Koh, President and CEO of IT & Mobile Communications Division, Samsung Electronics. "We created Galaxy Fold for those that want to experience what a premium foldable device can do, beyond the limitations of a traditional smartphone." 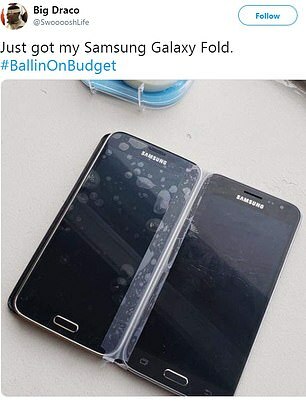 Galaxy Fold is in a category of its own. It delivers a new kind of mobile experience allowing users to do things they couldn't do with an ordinary smartphone. Users now have the best of both worlds; a compact device that unfolds to reveal Samsung's largest-ever smartphone display. 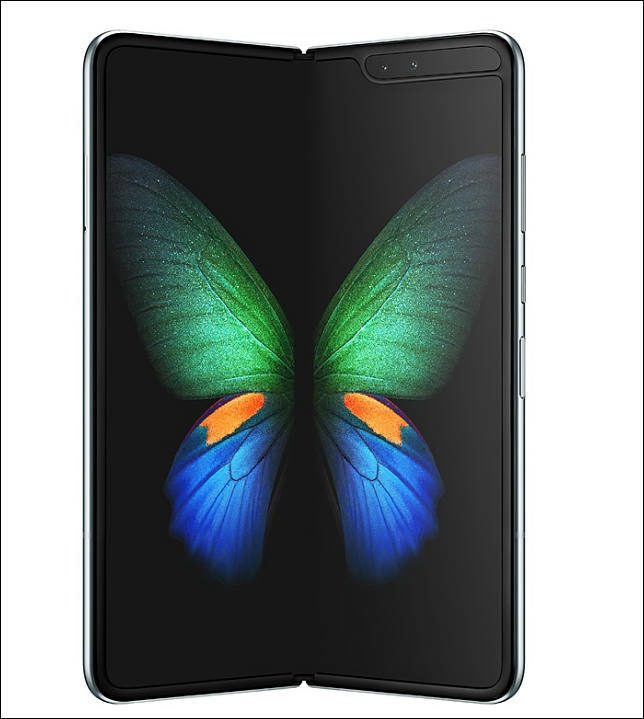 Galaxy Fold brings together material, engineering and display innovations, developed over eight years following the debut of Samsung's first flexible display prototype in 2011. 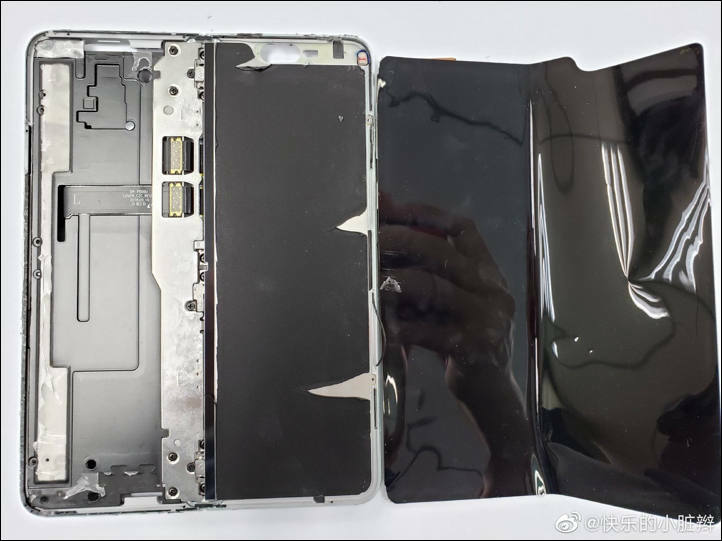 New Hinge Mechanism: Galaxy Fold opens smoothly and naturally, like a book, and closes flat and compact with a satisfying click. To achieve this, Samsung engineered a sophisticated hinge with multiple interlocking gears. This system is housed in a hidden enclosure for a seamless and elegant look. 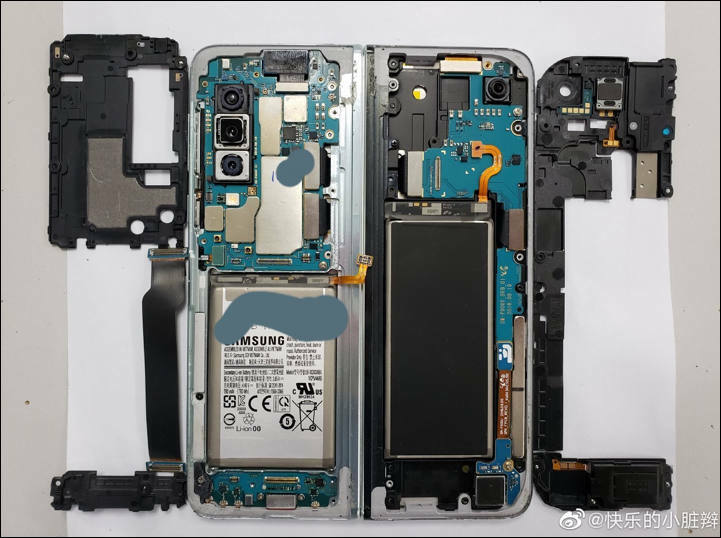 New Design Elements: From the screen to the housing, to every element you can see and touch -- Samsung left no stone unturned. The fingerprint scanner is found on the side where the thumb naturally rests, so the device unlocks easily. Two batteries and the components are evenly distributed so Galaxy Fold feels balanced in your hands. Colours with unique finishing---Space Silver, Cosmos Black, Martian Green and Astro Blue---and the engraved hinge with Samsung logo complete its elegant fit and finish. Galaxy Fold was designed with smartphone users in mind -- driven by bigger and better form factors that boost their experiences. Galaxy Fold changes to the screen you need, the moment you need it. Slip it out of your pocket for one-handed calls, texts and more, then open for endless multitasking and higher quality viewing on our largest mobile display for presentations, digital magazines, movies, and AR content. Multi-Active Window: The possibilities are virtually endless with Galaxy Fold -- designed for the ultimate multitasker. You can open up to three active apps simultaneously on the main display so you can surf, text, work, watch and share without losing a beat. App Continuity: Make intuitive, seamless transitions between the cover and the main displays. As Galaxy Fold opens and closes, apps will automatically show up where you leave off. When you're ready to take a photo, make in-depth edits, or want to take a closer look at you feed, open the display for a big screen and fuller canvas. Samsung worked with Google and the Android developer community to ensure that apps and services were available for the Galaxy Fold's unique experience. Galaxy Fold is built for heavy and intense use whether it's working, playing or sharing ---all of which requires advanced performance. Packed with powerful hardware, the Galaxy Fold is more than up to the task. Do More: To ensure everything runs smoothly, even with running three apps simultaneously, Samsung equipped Galaxy Fold with a high-powered, next-generation AP chipset and 12GB of RAM with PC-like performance. The sophisticated dual battery system was specifically engineered to keep up with you. Galaxy Fold is also capable of charging itself and a second device simultaneously via Wireless PowerShare, while connected to a regular charger so you can leave your second charger at home. Ultimate Multimedia Experience: The Galaxy Fold is designed for entertainment. Thanks to immersive visuals on the Dynamic AMOLED display and crisp, clear sound by AKG with the stereo speakers, your favourite movies and games come to life in rich sound and colour. Our Most Versatile Camera Yet: No matter which way you hold---or fold---the device, a camera will be ready to capture the scene, so you never miss the moment. 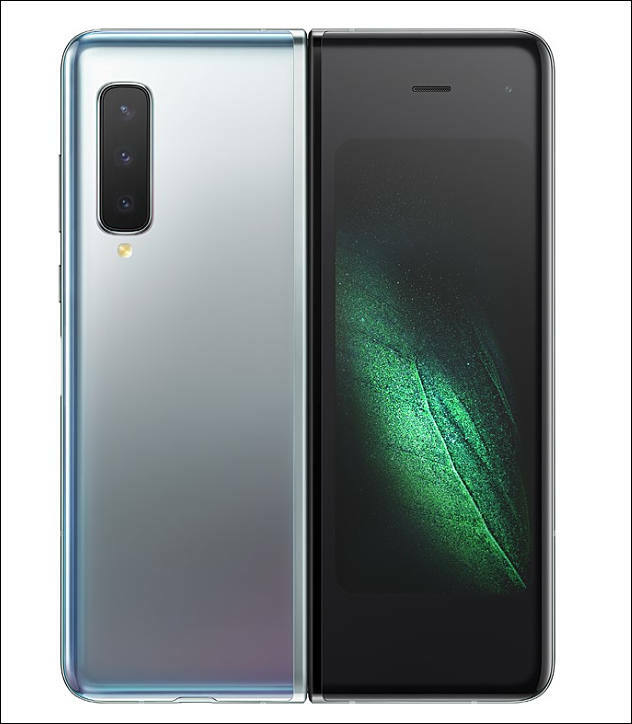 With six lenses---three in the back, two on the inside and one on the cover---the Galaxy Fold camera system has flexibility built in. Galaxy Fold introduces a new level of multitasking, allowing you to use other apps during a video call. Galaxy Fold is more than a mobile device. It's a portal to an entire galaxy of connected devices and services that Samsung has developed over the years to make it easier for consumers do the things that they couldn't do before. Pair with Samsung DeX for even more productivity power with a PC-like experience. Bixby is supported with new personal intelligence functionalities like Bixby Routines to help anticipate your needs, and Samsung Knox will keep your data and information safe. From using your phone to make purchases with Samsung Pay, to using Samsung Health to manage your health and wellness, the Galaxy ecosystem is there to as you pursue the things you're passionate about. Several users have quipped that bendable phones bear an uncanny resemblance in their function to the original flip phone, released in the 1990s. Other reviewers have indicated a constant flickering screen.